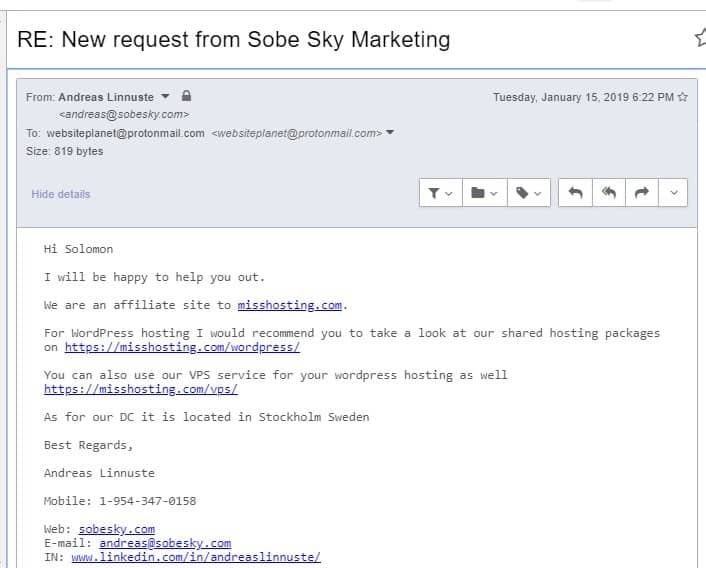 Sobe Sky Marketing Review 2019: Is Sobe Sky Marketing a Good Hosting? Hollywood (Florida)-based hosting provider Sobe Sky Marketing was established in 1997. This company specializes in providing SEO hosting solutions, VPS, and dedicated server solutions to individuals, SMEs, and large enterprises. Sobe Sky Marketing is a small web hosting company located in Hollywood in the United States; but note that this is Hollywood, Florida, not its Californian namesake. The company was founded in 1997 with the aim of providing search engine optimization hosting services, and its specialist SEO hosting team includes advertising and marketing experts as well as hosting professionals. This provider also provides VPS and dedicated server solutions to small and medium-sized business enterprises and large corporations in the United States. Sobe Sky Marketing’s virtual servers are housed in a high capacity environment in the U.S. Customers can easily upgrade and downgrade resources such as IP addresses, storage, and traffic without affecting server availability or performance. This is good news for fast-growing businesses. The vendor’s Cloud VPS Hosting solutions come in two flavors: standard and premium. The standard category’s most popular plan includes features like 1GB RAM, 1 core processor, 30GB SSD disk, and 2TB bandwidth. The premium category’s most popular plan includes 6 vCPU, 16 GB RAM, 160 GB disk space, and 6 TB bandwidth. All the vendor’s Cloud VPS hosting plans support both IPV4 and IPV6. Sobe Sky’s SEO hosting packages include Basic, Prime, and Enterprise. Basic is the starter package that includes 4 GB RAM, 60 GB disk space, and 2 TB bandwidth. Enterprise is the vendor’s most advanced SEO hosting package that comes with 8 GB RAM, 240 GB disk space, and 4 TB bandwidth. All SEO hosting packages come with Intel Xeon 2.40 GHz 2-Core processors and 100 Mbit connectivity. The packages also include a specified number of IP addresses, but you have to pay extra for each IP address you get. Sobe Sky Marketing’s hosting solutions use Windows, Linux, and other Unix operating systems. There are no backup services, so customers who want backups will have to outsource this to someone else (or do it themselves). There are also no included SSL certificates, so again you’ll have to source these separately. The Florida-based business offers some of the most affordable hosting plans in the U.S. The prices are clearly listed on the website, with no hidden costs (apart from the excluded elements such as SSL certificates). Migrating your website to their servers is easy and free. Customers can sign up on various billing cycles from 1 month to 36 months, but there are no apparent incentives for longer sign-ups. Although this vendor’s hosted websites experience minimal downtime, there is no uptime guarantee and no refund policy. You can contact the customer support team via telephone, or email, but there is no live chat and no support ticket system. Although the support team is not available 24/7, this vendor does seem to have invested substantially in its support desk. When I sent them a message via their website contact form, I received a response less than 24 hours later. Unfortunately, Sobe Sky Marketing offers no knowledge base and no FAQ page, so there is no obvious way to support yourself. Sobe Sky Marketing is a great option for businesses of all sizes looking for SEO hosting solutions. The ability to scale up hosting resources easily is a major reason why many customers prefer this vendor. However, its lack of uptime guarantee, SSL certificates, and refund policy keeps many other would-be customers from committing themselves to these hosting solutions. Wondering how Sobe Sky Marketing stacks up against other Web Hosting companies? Enter any other Web Hosting company and we will give you a side-by-side comparison.